← Can you have to much Leopard? Oh those boots! I found these for $20.00 at the United Colors of Benetton’s outlet store at the Citadel about 12 years ago. Pointed, flat, short and OMG! I just loved them. Funny, I didn’t wear them for oh, maybe 8 years or so, but for 20.00 bucks? Really? definitely worth the investment. I just had them polished and they are fab! The Jeans and Jean Jacket are Zara and the funky Belt is from Free People — Come on peeps ya gotta add a little funk now and then. The Tee is from Vince. And of course there’s my Luco from Louis Vuitton. I don’t wear it often enough, usually I save it for travel but what the heck, right? I considered 2 pics, the bottom half and the top half. But — a selfie with an ipad is, well, really, really odd. trust me. Saturday’s are a beautiful thing. 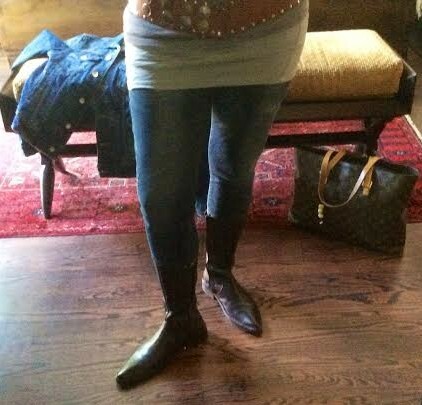 This entry was posted in style and tagged Boots, Louis Vuitton, What I'm wearing, Zara. Bookmark the permalink. Thank You Luanne! I love putting things together, mixing old and new.